Jungle Red Writers: CAN We Cook! HALLIE EPHRON: Confession: I serve canned soup for the holidays. 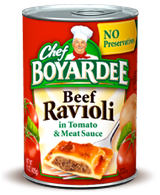 While I rarely open canned anything these days because most ingredients are available fresh in the market, during the holidays I hark back to the "traditional" foods I grew up with which, sad to say, often involve ingredients from a can. A favorite in our house was mushroom-y potatoes made with real potatoes, sliced and parboiled, layered in a baking dish with butter; a can of condensed Campbells mushroom soup mixed with a little hot water or milk spread o'er the top; bake for about 40 minutes or until bubbly and brown. But my recipe leaves out Step one: Do NOT read the label. Because you will find that a serving of that canned soup contains 1/3 of your daily allowance of salt and virtually no other nutritional values beyond less than 5 per cent of your daily protein. So are there icky delicious holiday dishes in your home that start life in a can? RHYS BOWEN: When I was a new bride and newly in America I found out that all the housewives older than I gave me recipes that contained either a can of creamed soup, jello or cool whip... all of which were ingredients I had never used and never planned to use. But I have to confess to enjoying the green bean casserole that my daughter's MIL serves AND I have a delicious chicken breast recipe that uses a can of cream of chicken soup with the chicken breasts and fresh mushrooms and then covers the whole thing with stuffing mix. LUCY BURDETTE: Weren't we all raised with the can philosophy? 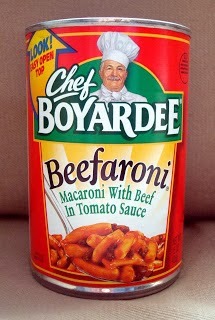 Oh man, we had canned raviolis, canned spaghetti, canned gravy, and yes, cream of everything in casseroles. Here's something I'm making for the first time on December 31: stuffed shrimp. This is for my son-in-law, whose mom used to make it for his birthday and other special occasions. (He'll be with us for New Year's Eve day, his birthday!) She kindly sent me the recipe which includes cream of lobster soup, as in Campbell's. I'm thinking an easy little white sauce would provide the same effect, only without the salt and chemicals. What say you, Jungle red chefs? HALLIE: I say ZOOT ALORS! MAIS NON NON NON!!! Bite the bullet, Miss Lucy, and buy the canned soup... unless you're going to make a lobster broth base for your "easy little white sauce." It's his birthday, for heavens sake. Staples in both hubby's and my family's holiday dinners are green bean casserole and broccoli cheese casserole, the former made with canned green beans--yuck. But my sister-in-law made a fab broccoli casserole this Thanksgiving. She used fresh, barely steamed broccoli instead of the traditional frozen, grated cheddar instead of Velveeta (not a food fit for human consumption), mixed with cooked rice and a can of Campbell's mushroom soup. She topped it with Pepperidge Farm croutons she smashed in a ziplock baggie. The casserole was so delicious I'm actually tempted to make it myself. PS My hubby keeps canned spaghetti, ravioli, and Wolf Brand Chili in the pantry. Those are his idea of comfort foods. I might eat them if we had a long-term power outage. Otherwise, not that desperate. HANK PHILLIPPI RYAN: I remember LOVING Beefaroni. LOVING it. I wonder what it tastes like now, all orangey and fakey? But I still remember it was wonderful. We also loved Campbells Chicken Gumbo soup. (What a random soup choice, I know.) My brother Chip loves the cranberry sauce that gooses perfectly out of the can so you can still see the wavy lines on it. I'm afraid my affinity with cans now lies only with canned white tuna in water, an absolute staple. JULIA SPENCER-FLEMING: Hank, I have had occasions to taste Beefaroni as an adult (kept on hand occasionally for kid food emergencies) and it tastes sort of wonderfully horrible. You can recognize your consuming enough salt and preservatives to drop you on the spot, but at the same time - it's Beefaroni! God KNOWS what the meat actually is. 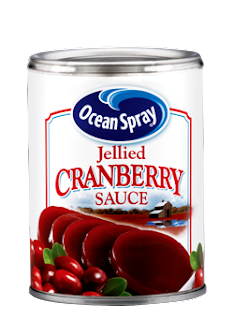 I'm not using canned goods for the hols, except for canned cranberry sauce. I don't care how many recipes I read that start with "Soak one pound of fresh organic cranberries overnight." I want my cranberries quivering on a plate in a six-inch long cylinder with ridges in them. When Ross was diagnosed with high blood pressure, his doctor gave us a tip I now use: rinsing canned veggies will get rid of most of the sodium content. Since canned vegetables often have more nutritional content than frozen, I now use them a lot. Of course, it doesn't help if you're serving canned cream corn. SUSAN ELIA MACNEAL: Actually, corn soufflé, one of my favorite holiday recipes, uses canned creamed corn — but it's delicious. It's actually Hallie's sister Nora's recipe, from the cookbook Our Meals by New York City Ballet dancers (now retired) Jock Soto and Healther Watts. Fantastic with fried chicken and collard greens. OK, I just looked this recipe up online — and while Soto and Watts call it "Nora Ephon's Corn Soufflé," she herself called it, in Nora's Cookbook, " Cornbread Pudding Made of Horrible Ingredients." Regardless of what you call it, it's really good. Butter a 9-x-13-inch baking pan. In a large bowl, lightly beat the eggs. Add the corn, corn bread mix, and milk, and stir until just combined. Turn out into the prepared pan. Top with 6 tablespoon-sized dollops of sour cream, if desired. Bake for 45 minutes, until firm and golden. HALLIE: Oh that sounds delicious. It all does. Even the Velveeta. And I much prefer canned cranberry sauce to homemade. I LIKE the can lines on the sides and the slightly metallic taste. So 'fess up! Do cans make it into your holiday feasts? The Cranberry sauce for sure. That fresh stuff tastes like ....like .. well, not jelly. I simmer chicken breasts in that cream of mushroom soup, too, but with white wine and a few water chestnuts for crunch. Serve over rice. Anybody who misses Mexican food, may I suggest Mrs. Renfro's Green Chili Salsa. Chicken and pork leftovers become the super tacos and burritos. The traditional canned Christmas dinner! I can't stop laughing. Once my father asked me to go to the store to buy "slices" for the broccoli casserole. I asked him what kind of slices. He said Bordens. —Bordens what? —Bordens slices. —Slices of what? —Slices of orange stuff that looks like cheese but isn't. Don't get real cheese. It won't work. And get a can of Campbell's cheese soup. Don't get the kind you make nachos with. Get the kind you make Welsh rarebit with. We need it for the french fries. Only since it's Christmas get a few cans of those French fried onion rings and forget the fries. —I swear. Mmmm. Being a southern Californian, I grew up on canned tamales. Still a major comfort food - just don't look at the fat content! I used canned beans a fair amount - black, pinto, kidney, white - any of them, for chili, for bean salad, for beans and rice. But I always rinse them well before using. I'm just not organized enough to soak and then cook real dried beans. I also use little cans of green chilis, and tomato paste, and big cans of ground peeled tomatoes if I haven't frozen enough home made tomato sauce in the summer. But none of this is holiday food! Like everyone else, I have canned and jarred things in my pantry that make putting a meal on the table easier [think beans, vegetables of the “no salt added” variety, pumpkin, mincemeat, pickles and olives . . . .] Canned mushroom soup [actually, the stuff in my pantry is organic and comes in a little box] does make for a reasonable sauce in a pinch, but I generally cook from scratch simply because I like to cook. [I do not like the green bean casserole thing that every commercial tells me my family needs for their holiday dinner, so it never shows up on our table. And I do buy those fresh cranberries for cranberry relish for Thanksgiving.] And although my personal grumble is how anyone could ever call that stuff in the blue box macaroni and cheese, my favorite childhood memory is Cheez Wiz melted into hot spaghetti . . . .
Jack Getze - I make the chicken and water chestnut thing, too! Add a little sherry to the cream of chicken soup to make it taste like... something. And some thyme. Mrs. Renfro's Green Chili Salsa - I'll be looking for it. Reine, you are a hoot! Edith, I'd forgotten about canned tamales. And on beans. I usually start with dried, soak in boiling water an hour and they're good to go -- because they still have a little crunch when you're done but canned beans are so mushy. Joan - Cheese Wiz on hot spaghetti. Not sure I can go there. But it's remind me, my grandmother (a terrible cook) served spaghetti topped with canned condensed tomato soup and a pat of butter. Has anyone ever made pumpkin pie from real pumpkin? I think the canned stuff is pretty good, actually. I made my Halloween pumpkin into a pie. Just seeded it and cut it up and baked it until soft, first. Then peel comes off easy. Real pumpkin is a bit watery -- so I let the pieces drain in a colander for a few hours before I pureed it. Used the recipe off the canned pumpkin can (canned evaporated milk...) and it came out as good as if it had been canned pumpkin, which is my benchmark. I cannot stop laughing here. 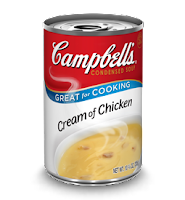 Yes, oh yes - I admit it - I use Campbell's soups for a lot of my cooking. Cream of Potato is on my grocery list to pick up for the hashbrown potato casserole I plan on serving with a ham (NOT canned) for Christmas dinner. (a bag of frozen hashbrown potatoes mixed with cream of potato soup and sour cream, topped with shredded parmesan and baked - we love it). Oh cheese whiz, so disgusting! Velveeta too--we ate blocks and blocks of it. I'm with the canned cranberry crowd. It's the perfect holiday food! Anybody but me notice that they've shrunk the cranberry sauce cans?? I think most of the packages and cans have shrunk . . . unfortunately, the price has not . . . .
We've trained ourselves out of canned for the most part. My son insisted on trying Beefaroni and just couldn't eat it (and he's 11 - he eats EVERYTHING). 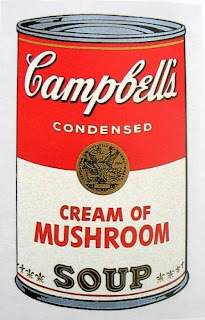 No green bean casserole for us - although I will use canned mushroom soup in a pinch. Tuna and canned pumpkin is about it (only because I just don't have time to bake down a real pumpkin for pie). I have been making my own cranberry sauce for almost 40 years. Since I lived next to a cranberry bog in Plymouth County, MA. I was always a "whole berry" person anyhow. Its wicked easy! One cup of water, one cup of sugar (I use Splenda), and a bag of berries. That's it! My husband and I both love it and my family looks forward to it every year. A bit of sugar-free preserves make it a bit sweeter. Any fruit will do. I never buy canned cranberry sauce. I try not to use canned anything but I can't resist sliced canned beets in vinegar. But I do rinse them. We try to eat as much fresh food as possible, without all those added ingredients. But I'm not perfect. White tuna in water and real canned pumpkin are on my shelf. Canned tomato soup makes the BEST topping/sauce for meatloaf. Spoon it over the top just before you pop that sucker into the oven. In my first kitchen (senior year at Barnard), I lived on canned tuna-- in casseroles nade with mushroom soup and shell noodles (now I add sherry and sliced water chestnuts on the rare occasions I make it) or made into tuna salad. *Canned baked beans are my staple for a day when I'm too exhausted to cook. If you have a hot dog around, you can cut it up into the beans and then heat to a low boil. I've been known to eat canned black beans right out of the can-- just heat, then serve with yellow rice and a rotisserie chicken. And I also like canned refried beans. And long long ago, when I was on the original Weight Watchers program, I'd devour a can of French cut green beans (in those days an unlimited vegetable), right out of the can, to take the edge off while I cooked dinner. Yay for canned beans (although I've never tasted green bean casserole. Kaye, that potato thing sounds DEE-LICIOUS! 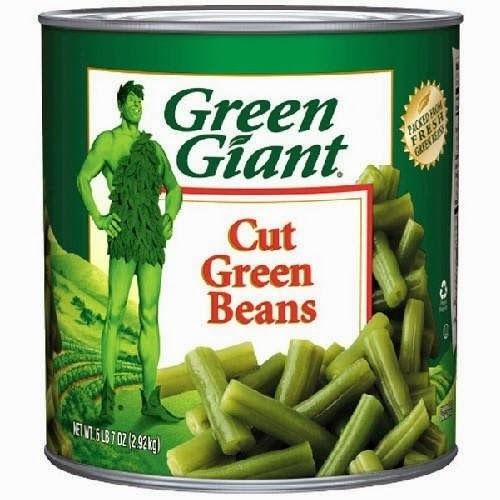 Ellen, I love canned green beans like that, too. Don't they consider canning one of the big inventions that changed the way the world works? Hank, it was. Commercial canning was the first thing that made out-of-season vegetables available to everyone. Also beef, jelly, fish, broth - before commercial canning, women would pressure can their own produce and meats in glass Mason jars (another life-changing invention in its day) but that required a household to have access to farm food and lots of time and space in which to do the canning. And of course, you could only can what grew or was raised locally. Commercial canning relieved farmwives of a huge amount of work and brought an amazing variety of food to the ever-growing numbers of people living in urban areas in the late 19th century. Something I didn't already know, but just looked up: canning was a huge boon in wartime, as armies could bring their own nutritionally-varied rations with them instead of trying to buy, trade or steal local food. We've become so used to having fresh produce and an amazing array of foodstuffs just flown or trucked in from everywhere, we forget the alternative to canned goods was once either doing without or hours and hours of prepping food and boiling jars - in August. Makes me feel a tiny glow of gratitude for those sodium-laced cans! How about "Waldorf salad" made with Miracle Whip? Or the jello salads - orange jello, pineapple chunks, pineapple juice & carrots - topped with a dollop of yes, Miracle Whip! Or the green jello salad - lime jello, mini-marshmallows, more pineapple, nuts and Cool Whip. I made these for years when I had my own family because I thought it was our tradition. Finally caught on that no one would even eat a bite. My MIL's go-to ingredient was Open Pit BBQ sauce. Bad enough on grilled meat, but she made spaghetti with it: the fat #8 spaghetti, ground hamburger, coarsely diced onion, and lots and lots of Open Pit. On holiday visits when this was served my husband always suddenly got sick, leaving my poor son as the unfortunate recipient of a huge plate of it. Made fresh cranberry sauce for the first time this year and won't go back to the quivering can. So easy! Didn't use the Splenda, though, after doctor and pre-diabetes counselor told me sugar substitutes have a chemical that turns into formaldehyde in your body. May or may not be true but it was enough to scare me. Okay, here's a test.... What product are these the ingredients for?? Ha ha, Hallie, I'm with Jack! And I despise Miracle Whip. I do cook with dried beans, but actually find canned ones do just fine most of the time as long as they're rinsed. And I'm a naysayer on the canned cranberry sauce. I make one from fresh--didn't I put the recipe up on JR last year, maybe? Cranberries, white vinegar, honey, orange zest, mustard seeds, minced jalepeno, black pepper. Not only yummy but beautiful. Julia, so interesting about the canning... So MUCH we take for granted! Green bean casserole was one of our Christmas staples. I used to love the Campbell's Bean with Bacon soup. And I still have various recipes that use the cream-of soups. Back then, you couldn't help but be a domestic goddess if you used Campbell's soup, eh? Sounds like it could be Velveeta?? Yes, Cool Whip! Fulfills our daily requirement of sodium caseinate. ANd Debs, that cranberry thing sounds yummy. Julia, I'm with you on the canned cranberry sauce. I love it! 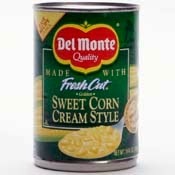 I grew up on corn pudding, which calls for the canned cream corn. It was a dish that everyone had in common where I grew up in Maysville, KY (home of Rosemary Clooney, gateway to the South, best country ham in the world at Hutchison's Grocery in business since the late 1800s). 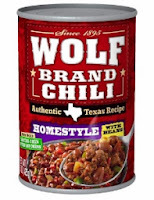 I use canned mushroom soup in a spaghetti casserole I make, canned pumpkin in my pumpkin pies, canned asparagus in my asparagus casserole, and canned kidney beans and tomatoes in my chili. I know people that use canned veggies for their vegetable soup, but I'm a purist there and prefer fresh veggies. Oh, and I do love my canned sliced beets. I buy the little cans just for me, and I eat the whole can. Kaye, would you be willing to share your hash brown casserole recipe with us? And Hank, yes, I think that is the way the world is divided. Me, I'm a "Miracle Whip no" person. There's something just wrong about it. I used to make cranberry sauce from whole berries. But hubby and I were the only ones who would eat it. After the year that I quartered the recipe and still had way too much left over, I went back to the can (and I don't eat that at all). Mary Sutton DING DING DING! It's Cool Whip. Lisa Albert guessed Cool Whip first! Deb, Hank, Mary, I must spurn you now. Begon into the darkness, oh ye Miracle Whip nay-sayers! I like Miracle Whip. But I'm also eating mayo now too. We still eat green bean casserole at the holidays, courtesy of Mom. 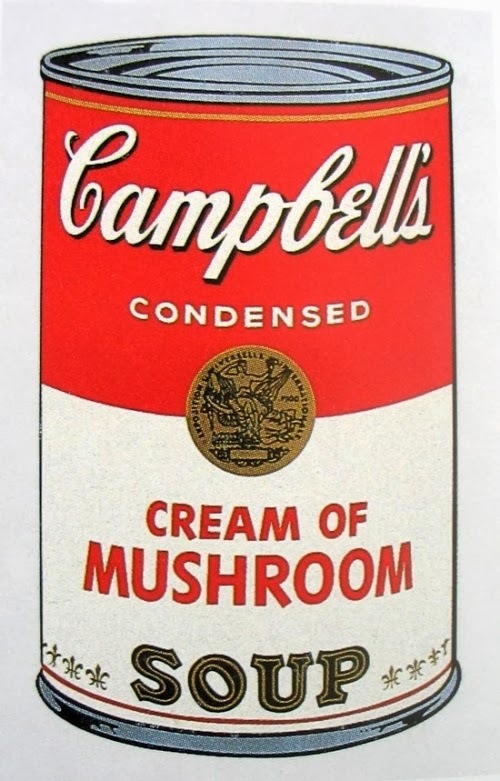 Can't live without cream of mushroom soup. I abhor that jellied cranberry mess that slides out of the can like some alien life form. Yech. I make a fresh uncooked cranberry relish with navel oranges, pecans, and sugar. My son was really into Popeye years ago and wanted canned spinach to down, just like Popeye. Needless to say, after one bite he decided Popeye could have it. My one food horror in cans is asparagus. OMG, that is awful. You are the first 3 people I have known who actually know about canned tamales. My grandpa used to feed me the Hormel version (was there any other? ), and I loved it. I still buy a can now and then, and I admit - I still love them! This post is also great timing - I was planning to indulge in one of my canned food secret eatings: cream of mushroom soup over toast. It's not holiday food, but it is cold weather comfort food for me. Some foods (and the feelings that go with them) just can't be replaced! Being the bad mother that I obviously am, my children grew up eating Miracle Whip rather than mayonnaise. Fast forward to my daughter entertaining her in-laws, who inform her in no uncertain terms that Miracle Whip is most definitely NOT mayonnaise. Guess there are lots of intransigent opinions on Miracle Whip . . . .
Kathy Reel - I'll be happy to share the recipe. I need to find it to use for Christmas and as soon as I do, I'll post it here, so check back. Re: Miracle Whip vs. Mayo. I really do think it's an either or thing and people here in the south carry it one step beyond. It's gotta be DUKE mayo. Kim: OMG "I was planning to indulge in one of my canned food secret eatings: cream of mushroom soup over toast." How different is this I wonder from British chipped beef on toast. Someone who's had it can tell us. Why not, since I love mushroom soup over potatoes. Bake uncovered at 350 for 45 minutes or until bubbly. I grew up eating creamed tuna on toast that my mother made, using white flour and the oil from the tuna can (remember that? ), and then adding milk. Supreme comfort food. She and I were the only ones who liked it in the family.